Gemstone Meanings | What Does Your Birthstone Mean? In ancient times, gemstone meanings were ascribed to the influence the planets had on certain gems which were believed to transmit the powers attributed to those planets and influence the person holding or wearing that stone. According to India Astronomy it is further held that certain of these astrological gemstones are healing, and were and still are today, prescribed as "cures". By selecting a gemstone with the appropriate gemstone meanings and consulting gemstone properties courtesy of the Mohs Scale, couples in love can create an engagement ring or alternatively choose an antique gemstone engagement ring with greater personal and astrological significance. 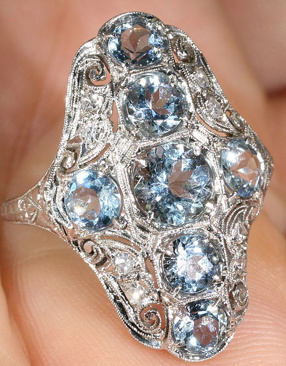 Ladies born in March, for example, wearing an antique gemstone engagement ring set with her birthday gemstone, which is the aquamarine, possesses a miniature work of antique art more intimately associated with her personality. That a special stone was dedicated to each month and that the stone of the month possessed a special meaning or "cure" that could transmit to those born in that month, goes way back to the First century when Jewish historian Josephus proclaimed a connection between the twelve stones in Aaron's breastplate, the twelve months of the year and the twelve signs of the zodiac. For all those gifted with a touch of imagination and romance, birthstones and gemstone meanings can hold great significance. As a choice for an engagement ring stone, or for your traditional wedding anniversary gifts. Birthstones are an older, traditional choice and a personal alternative to white diamond engagement rings. (CONSTANCY)- derived from the Latin word, Granatum. According to legend Noah used a garnet to light his ark. The gem resembles the pomegranate. (SINCERITY) - from the Greek word amethystos, meaning without drunkenness. Amethysts have been used to signify Christian humility. Believed to protect a wearer from extremes of passion. (INNOCENCE) - used in an ancient ritual in India, where wealthy parents would sprinkle tiny diamonds over the heads of infants to keep them pure and virtuous. Australia is the leading producer of these rare and beautiful pink gemstones - known as the Argyle Pink Diamonds. (CLEAR THINKING) - praised for both its' beauty and coolness to the touch, some believed the sapphire could put out fires. It was worn by the Greeks speaking wisdom from the Oracle. (HEALTH & LONGEVITY)- Its round shape and luminosity help explain why it was long considered the sacred gem of the moon. (LOVE & SUCCESS) - the rich green of the emerald gemstones make them an appropriate symbol for new life. Said to be helpful to women, bringing love and safety in childbirth. (FIDELITY) - named for the island of Topazios, the ancient Greeks believed the yellow topaz guarded against calamity. (SUCCESS, STRENGTH)- believed to guarantee success in anything tried. Carnelian (sometimes referred to as cornelian) is found primarily in India, and in South America. The most favorable pieces are a deep red to red-orange hue. Carnelian was once considered strictly the property of nobility. People holding a high social status were often buried with this fleshy, pinkish-red gemstone. (FIDELITY) - named for the island of Topazios, in Ancient Greek Mythology and gemstone meanings, it was believed that yellow topaz guarded against calamity. It should be worn by every Scorpio to guarantee protection from "tears of sad repentance." (TRUTH AND FRIENDSHIP) - sagittarius also responds to the energies of topaz, chlorite, turquoise and red tourmaline. (CONTENTMENT) - named from the Latin for red, it is said a ruby's luster will be revealed even if the stone is hidden beneath thick clothing. Brought to you by the Italian Trade Commission; birthstone and gemstone meanings.